To build your own electronic circuits that interface with a parallel port, you need to use a DB25 connector that attaches to your electronic circuit. The standard parallel port on a computer uses a DB25 female connector, which means that you need to provide a DB25 male connector for your circuits. You have several ways to fashion a DB25 connector for your circuits. The simplest way is to find an old parallel printer cable, cut it a few inches past the male end, strip back the insulation, and separate the 25 wires that run inside the cable. Strip the ends of each of these wires and then use your ohmmeter to match up wire with the individual pins on the connector. Keep good notes so that you’ll know which wires to use for your circuits. 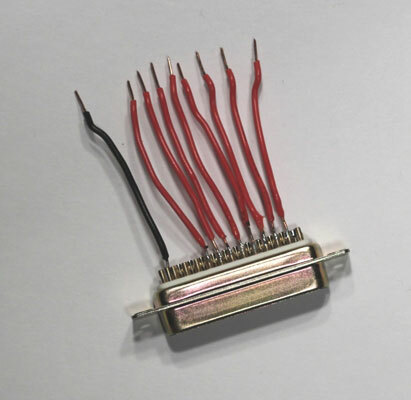 Alternatively, you can purchase a male DB25 connector and solder wires to each of the pins. To assemble a similar cable yourself, you need are a male DB25 connector, some 18-gauge solid wire, some solder, a soldering iron, and a vise or third-hand tool to hold the connector while you solder. You may also want to get some magnifying goggles. Although they’ll make you look like Christopher Lloyd in Back to the Future, they make the job much easier by helping you see the project more closely.